Developing a new drug from the original idea to the launch of a finished product is an increasingly complex process often spanning 12-15 years and costing over $1 billion dollars.1 With so much at stake, huge investment has been made into technology and process improvements to drive down costs, increase efficiency and ultimately, bring better drugs to the market faster.2 The widespread adoption of automated high-throughput screening (HTS) and, more recently, ultra-high throughput screening (uHTS) represents one such process change. Presenting researchers with the ability to screen huge chemical libraries against an ever-increasing range of targets for lead discovery. In modern drug discovery HTS is typically described as testing between 10,000 to 100,000 compounds per day with uHTS defined by screening numbers more than 100,000 generated data points per day.3 Drug discovery has rapidly come to rely on this screening capability and the automation technology that enables it but, many believe HTS is at a crossroads, presenting users with a choice between quantity or quality.3 Should they move toward continuing to increase throughput or, to shift the focus of HTS development toward gathering more relevant biological data? Automation has played a huge role in the development of HTS to date and, will likely be crucial in tackling the hurdles HTS is yet to overcome. By reducing the number of repetitive manual tasks, the potential for error is reduced and significant time savings can be realized, allowing the scientist to concentrate on research rather than repetition. Pharmaceutical companies have therefore invested in a wide range of automated instruments to increase the throughput across all areas of the early stage drug discovery process, from target-based research, combinatorial and analytical chemistry to primary and secondary screening.4 With automation now commonplace in the HTS drug discovery field, scientists are now looking at how they can get the most of out their technology. To study immunotherapy as a cancer treatment, scientists need efficient, in vitro screening models to examine targeted therapy options. Download this application note to learn more about a novel 3D immune oncology model for high throughput testing of tumoricidal capability. Figure 1. 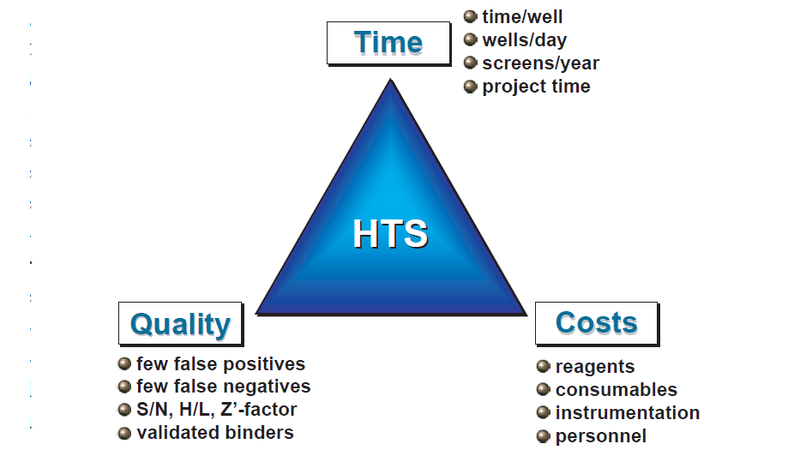 "The magic triangle of HTS” shows the key success factors for modern lead discovery via HTS—namely, time, costs, and quality. All 3 factors are closely linked, and every change on either one of these factors influences the setup of all the other factors as well. Credit: Lorenz M. Mayr and Peter Fuerst, The Future of High-Throughput Screening. DOI: https://doi.org/10.1177/1087057108319644. By its very nature, HTS involves many samples so, the time taken to measure an individual well is an important factor for increasing efficiency. This however, can be a narrow view and the HTS project should be considered as a whole. By looking at the time taken from the initial nomination of a target through to the delivery of the final results, scientists are presented with a wider range of opportunities to optimise their process. In fact, the time taken to actually screen against a target at most modern HTS facilities represents only a minor part of the project. Most time consuming are the steps taken to develop and adapt an assay, analyse and interpret the data, validate a hit and then carry out follow up screens. Process quality must also be considered, particularly in programs with large data sets because proper data analysis requires results with high statistical quality. The quality of data can be measured using several tools such as the number of false negatives and positives, signal/noise and Z’ factor amongst others.9 However, the sensitivity of an assay for reference compounds should also be considered when optimising for quality. Essentially assays should be developed to maximise statistical quality whilst also attempting to achieve sensitive detection of weak inhibitors to maximize the potential of discovery of regulators of target activity.10 By considering time, cost and the process it is possible to evaluate every lead finding effort and technology to optimise screening efforts. As scientists continue to move through the so-called “third generation of HTS” we will likely see more flexibility in the processes used for novel lead discovery and a stronger focus on selecting the appropriate strategy for the proposed target.3 Considering the future, these trends are likely to continue to drive the successful application of HTS, expanding the potential targets that can be addressed whilst reducing the time and money taken to bring drugs to market and all the time increasing our reliance on automated science. 1. Hughes, J. P., Rees, S., Kalindjian, S. B., & Philpott, K. L. (2011). Principles of early drug discovery. British journal of pharmacology, 162(6), 1239-1249. 2. Bleicher, K. H., Böhm, H. J., Müller, K., & Alanine, A. I. (2003). 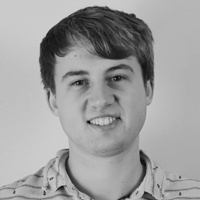 Hit and lead generation: beyond high-throughput screening. Nature reviews Drug discovery, 2(5), 369-378. 3. Mayr, L. M., & Fuerst, P. (2008). The future of high-throughput screening. Journal of Biomolecular Screening, 13(6), 443-448. 4. Macarron, R., Banks, M. N., Bojanic, D., Burns, D. J., Cirovic, D. A., Garyantes, T., ... & Schopfer, U. (2011). Impact of high-throughput screening in biomedical research. Nature reviews Drug discovery, 10(3), 188-195. 5. Fox, S. J. (2006). A History of High-Throughput Screening for Drug Discovery: A Special Report Summarizing Six Comprehensive Industry Studies in the Years 1998–2005. HighTech Business Decisions, Moraga, CA, USA. 6. Klumpp, M., Boettcher, A., Becker, D., Meder, G., Blank, J., Leder, L., ... & Mayr, L. M. (2006). Readout technologies for highly miniaturized kinase assays applicable to high-throughput screening in a 1536-well format. Journal of biomolecular screening, 11(6), 617-633. 7. Guo, M. T., Rotem, A., Heyman, J. A., & Weitz, D. A. (2012). Droplet microfluidics for high-throughput biological assays. Lab on a Chip, 12(12), 2146-2155. 8. Assay Assembly for Miniaturized Quantitative PCR in a 384-well Format using the Echo® Liquid Handler. Available at http://www.labcyte.com/media/pdf/APP-Labcyte-G102-Echo-555-384w-qPCR.pdf (Accessed May 19 2017). 9. Malo, N., Hanley, J. A., Cerquozzi, S., Pelletier, J., & Nadon, R. (2006). Statistical practice in high-throughput screening data analysis. Nature biotechnology, 24(2), 167-175. 10. Mayr, L. M., & Bojanic, D. (2009). Novel trends in high-throughput screening. Current opinion in pharmacology, 9(5), 580-588.